When doing small dimensions, the arrows were outside the witness line. I went poking around in Preferences > Dimensions, and now, the arrows are inside. 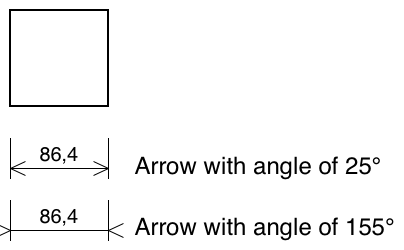 Also, my arrow choices don't include the outside arrows, like in George's great manual. What did I do, and how can I fix it? Re: I did something with the arrows. What? RealCADD does not have the possibility to do this automatically. But I did that in RealCADD! The one in the upper left was done first. Then I fooled around in the preferences, and when I entered the one in the lower right, that's what I got! I think it can depend on whether you select for the dimension to be above/below the line or centred. If you select above or below, then I can only make it do you right hand result. The left hand image is with "below" selected - the rest are with "centre" selected. Once it can squeeze the dimension in between the witness line arrows it seems to do so, but if it can't it puts the arrows outside. In the image, this has happened when the line was about 60 long. I can't make it do your left hand one! Thanks, George. I’ll give it a look. I did the left one the regular way, and moved the number manually!